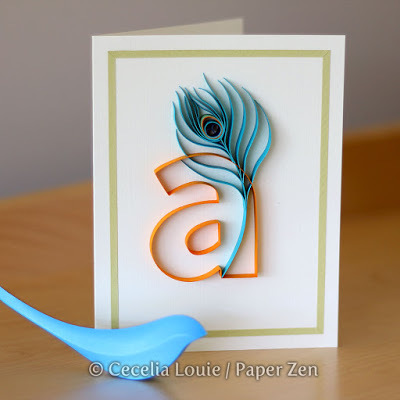 Cecelia Louie / Paper Zen Cecelia Louie has fantastic video tutorials. The link will get you to her blog. From there you can access her YouTube videos, download free patterns and templates, read all sorts of great tips and tricks, learn basic techniques. You can also buy patterns from her Etsy shop. And she has written a book! Ann Martin's web pages are must reads for quillers. She has so many wonderful tutorials, designs, photos, hints, and so on. allthingspaper.net The link will put you on her tutorial page but be sure to look at her jewelry, quilling FAQs, etc., too. Are you a member of the North American Quilling Guild? Please check us out! A new window will open by clicking on the NAQG logo to the right. 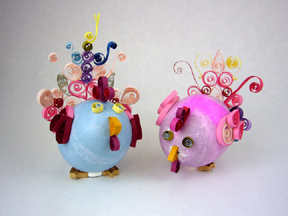 Kativilaga is a YouTube channel where you can fink many quilling tutorials. Some are subtitled, some are in English, all are good. There are many excellent tutorials for jewelry, 3D angels, funny chickens, and more. Click on the photo of my pair of chickens to get to Kativilaga's channel, investigate for more! The Captured Snowflake by Charlotte Canup is amazing. Just as intriguing as a ship in a bottle but something we quillers can make. Actually fairly easily! Please visit her website to purchase the instructions. 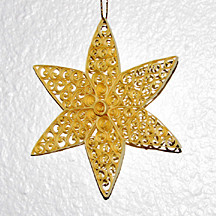 I made this star using Karen-Marie's video. She is Danish but as most Europeans are, multi-lingual. She will switch between Danish, German and English throughout most of her videos. Karen-Marie Klip's Star 13 - The Star of Hvide Sande. 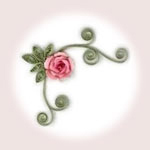 Honey's Quilling is another popular on-line quilling resource. She has tutorials, ideas, hints, and tricks. Honey is in Malaysia. Thank goodness for the Internet to connect us! This link leads to an interesting discussion regarding the media we use for quilling: paper strips. 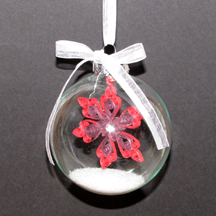 Once you are on Honey's Quilling page, be sure to look around. She shares her knowledge and talent!